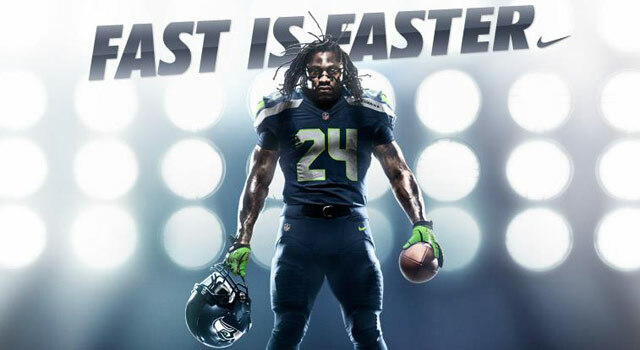 Published: April 3, 2012 at 12:15 p.m.
No team received a bigger uniform makeover from Nike than the Seahawks. 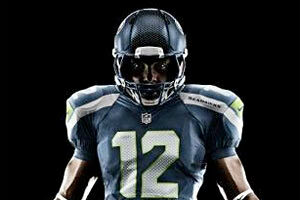 Nike rolled out its new uniforms for all 32 NFL teams Tuesday at a gala celebration in New York. NFL Network's Michelle Beisner was on hand as stars from around the league modeled the new duds, kept (mostly) under lock and key in the weeks leading up to Tuesday's launch. For those concerned about drastic changes, fear not. Beisner confirmed the majority of uniforms received tweaks to fabric and composition, but Nike managed to have a little fun with the Seahawks. Seattle's uniforms received the most drastic makeover of all, with a revamped helmet logo and revised color and design schemes for the team's home and away jerseys. In general, the Nike uniforms boast a tighter fit, with updated -- in some cases more vibrant -- color shadings and visible sew lines. New Orleans Saints running back Pierre Thomas, Denver Broncos cornerback Champ Bailey and San Francisco 49ers quarterback Alex Smith spoke with Beisner about the updated V-shaped neckline, which takes advantage of Nike's Flywire fabric. The neck appears looser, but the fabric technology allows jerseys to stretch but regain form without easily slipping over a player's shoulder pads on contact. Players expressed excitement over the uniform's lightweight design and greater range of motion. Philadelphia Eagles quarterback Michael Vick, who has a Nike endorsement deal, offered a positive review. "It's awesome. It's a great opportunity for Nike, and it's a great opportunity for the NFL," Vick told NFL Network. "We'll feel good and we'll play good, and I'm very excited for the Nike brand." â¢ Carolina Panthers jerseys feature the words "KEEP POUNDING" on the inside collar, commemorating former linebacker Sam Mills' fight with cancer. Mills, who died in 2005, used the phrase during an emotional speech to the team after a January 2004 playoff win over the Dallas Cowboys. â¢ Chicago Bears linebacker Brian Urlacher believes the tight jerseys will cut down holding and lead to greatness for teammate Julius Peppers. Urlacher told NFL Network the defensive end is set for "50 sacks," thanks to the new form-fitting jerseys. â¢ Opponents weren't excited about facing Ndamukong Suh before, but has the Detroit Lions' defensive behemoth ever looked more menacing? More to come throughout the day as we gather photos and video.